SLIGHTLY NORTH of West Point across the Hudson River is the historic village of Cold Spring that prospered from its cannon foundries during the American Civil War. The Parish of Our Lady of Loretto was founded in 1834 and was the first parish in the Archdiocese of New York established outside of Manhattan Island. The cornerstone of the present building was laid on August 12, 1906, and the building was completed in the following year. COMMISSIONED as part of the building's centennial restoration campaign, this elegant organ of only eleven ranks incorporates visual design elements from many schools of organbuilding, yet its overall form, carving, and polychrome decoration are a stylistic match to the building. 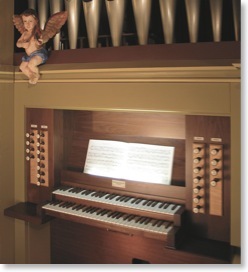 THE ORGAN INCORPORATES portions of five post-Civil War ranks of pipes believed to have been built by Levi Stuart. 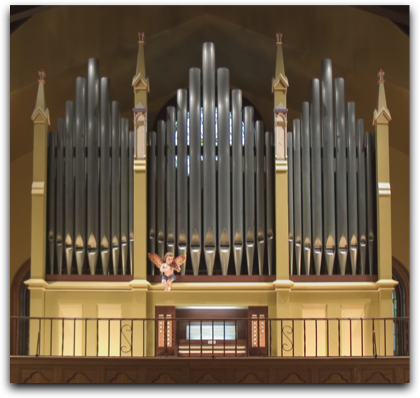 The tonal structure descends from the orgues de chœur of 19th-century France, instruments that produced surprisingly grand effects despite their size. Dr. Jennifer Pascual, Director of Music at New York City's Cathedral of Saint Patrick, served as both consultant and principal dedicatory recitalist.